This is the #1 question for me at any dinner party: Which is better, LED LCD TV or Plasma? This is a much debated topic and a fun one. When choosing between plasma and LCD TVs, you're actually selecting between two competing technologies, both of which achieve similar features (i.e., ,bright crystal-clear images, super color-filled pictures) and come in similar packages (i.e., .5 to 4 inch depth flat screen casing). To complicate the decision-making process further, price and size are two previous considerations that are rapidly becoming non-issues as LCD TVs are now being made in larger sizes and at competing prices with plasma. However, with the introduction of LED backed LCD TVs that category comparison is again hot. 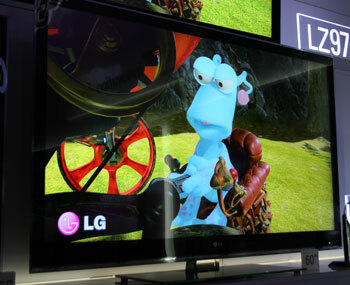 LED's sell for the highest price in the market per viewing inch now and LCDs have decreased in price to plasma TV levels. Despite their similarities, the two technologies are very different in the way they deliver the image to the viewer. Plasma technology consists of hundreds of thousands of individual pixel cells, which allow electric pulses (stemming from electrodes) to excite rare natural gases-usually xenon and neon-causing them to glow and produce light. This light illuminates the proper balance of red, green, or blue phosphors contained in each cell to display the proper color sequence from the light. Each pixel cell is essentially an individual microscopic florescent light bulb, receiving instruction from software contained on the rear electrostatic silicon board. Look very closely at a plasma TV and you can actually see the individual pixel cell coloration of red, green, and blue bars. You can also see the black ribs which separate each. Whether spread across a flat-panel screen or placed in the heart of a projector, all LCD displays come from the same technological background. A matrix of thin-film transistors (TFTs) supplies voltage to liquid-crystal-filled cells sandwiched between two sheets of glass. When hit with an electrical charge, the crystals untwist to an exact degree to filter white light generated by a lamp behind the screen (for flat-panel TVs) or one projecting through a small LCD chip (for projection TVs). LCD TVs reproduce colors through a process of subtraction: They block out particular color wavelengths from the spectrum of white light until they're left with just the right color. And, it's the intensity of light permitted to pass through this liquid-crystal matrix that enables LCD televisions to display images chock-full of colors-or gradations of them. LED TVs are a new form of LCD Television. The front panel on an LED TV is still an LCD TV panel and operates the with the same twisting crystals matrix. The backlight is the difference - changing from flourescent to LED (light emitting diode) based backlighting to LED lighting (light emitting diode) technology. LED technology is generally brighter and more flexible to manipulate. Plasma technology has certainly achieved quite high contrast ratios, a measure of the blackest black compared to the whitest white. Many plasma display manufacturers boast a contrast ratio of 100,000:1 these days though our tests using a standardized ANSI checkerboard pattern have not proven these numbers out. Plasma TVs achieve such impressive black levels by using internal algorithms to block the power to particular pixels in order to render a pixel "dark" or black. While this can limit a plasma television's gray scaling, it does produce exceptionally black blacks - depending on the manufactured plasma display element (i.e. glass). A plasma TV uses maximum power when it is producing full white. As a result, some 2nd tier manufactured brands of plasma TVs have an audible buzz or whining sound when displaying white or very light images. LCD (liquid crystal diode) displays, by contrast, utilize electric charges to twist and untwist liquid crystals, which causes them to block light and, hence, emit blacks. The higher the voltage passing through the liquid crystals in a given pixel, the more fully those crystals untwist and effectively block light - all of which makes these pixels darker. As opposed to plasma, LCD TVs (and LED) use the most power when displaying a very dark or black image. This is a difficult process, and despite recent improvements in LCD black levels, only the best LED LCD televisions have managed to match plasma technology in contrast ratio. The one continual drawback here for LCD is off axis viewing, when black levels and contrast consistently drop. We call it contrast degradation in our reviews. We have noted some improvement from LCD manufacturers lately in off axis viewing contrast, especially with the higher end LED backlit LCD TVs. ADVANTAGE: Closer than a year ago, but still Plasma. By better utilizing the LED backlit technology, LCD TV manufacturers have made great improvements in black levels and in many cases have nearly managed to match the contrast ratio of plasma TVs. However, Plasma displays still maintain an advantage on average in this category due to fading blacks when viewing LCD TVs from side angles. For scenes with a lot of dark and light images shown simultaneously - as with content originating from DVDs, video games, and NTSC TV signals - plasmas still consistently outperform LCD TVs. In plasma displays, each pixel contains red, green, and blue elements, which work in conjunction to create 16.77 million colors. Insofar as each pixel contains all the elements needed to produce every color in the spectrum, color information was more accurately reproduced with plasma technology than it was with other display technologies. The chromaticity coordinates were more accurate on most plasma displays. Though the color saturation resulting from the pixel design of plasma displays is remarkable, LCD technology has nearly caught plasma in gray scaling color accuracy. Plasma continues to exhibit more richness in color information and more natural coloration. Today, SMPTE color coordinates in top plasma displays still normally outperform those in LCDs, which tend toward oversaturation. LCD TVs and LED LCD TVs reproduce colors by manipulating light waves and subtracting colors from white light. This is an inherently difficult template for maintaining color accuracy and vibrancy - though most LCD displays manage quite well. LED backlighting has allowed for more grayscale in LCD TVs and recent color presentations by top LED TV makers have been extremely punchy. Colors can at times overwhelm and can be too vivid - depending upon the manufacturer. Extra blue push is something we see a lot in reviews. LED LCD televisions do produce a typically brighter picture, which along with the inherently better non-glare LCD technology, can be an advantage in a very brightly lit room. ADVANTAGE: Preference to plasma but depends upon room light, manufacturer and model. Plasma TV color richness and naturalness will prevail in rooms with lower to normal lighting - yielding a more realistic picture. LED LCD TVs perform better in very brightly lit rooms due to their inherent anti glare technology and brightness. Plasma manufacturers have made much of their near perfect 180 degree viewing angles, which is about as good as horizontal and vertical viewing angles get. This owes to the fact that each pixel produces its own light, rather than light being spread across the screen from one central source. Hence, each pixel is more readily visible because its brightness is consistent with every other pixel on the screen. One consistent area of superiority of plasma viewing angles is demonstrated when viewing dark material content, especially DVDs. A Plasma display holds the black levels from off axis, while LCD TVs lose black level intensity/contrast more as the angle off axis increases. This usually occurs after around 45 degrees off center. LCD TV manufacturers have done much to improve their displays' viewing angles. The substrate material on newer-generation LCD models by Sharp and Sony has helped to expand those units' viewing angles, though they still have some ground to cover before catching plasma. Expect the best LCD HDTVs to have around 120 degree viewing angles. Generally the performance should be about the same in terms of displaying the video image provided that the resolution of the plasma or LCD TV is 1080p or higher. Some plasma TVs still have 720p resolution and this would be a drawback to a defined static image. Burn in is the second factor. 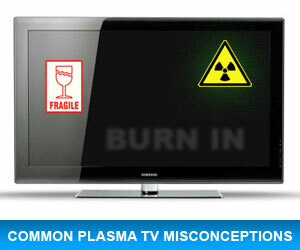 Though plasma TVs have substantial anti-burn in technology built in these days, there is still some risk there. ADVANTAGE: LCD and LED LCD, although I would rather look at the more pleasant light of a plasma display. The LED in an LCD TV could give me a headache. Plasma technology gets the easy nod here because of their excellent performance with fast-moving images and high contrast levels. It's an inherent quality of the technology. Plasma manufacturers have recently started publishing a specification of 600Hz with relation to the equivalent refresh rate speed of a plasma compared to an LED or LCD TV. It's really just for comparisons sake as each individual pixel in the plasma displays its color. There is no motion lag, drag, or blur in plasma TVs nor side to side judder when panning. 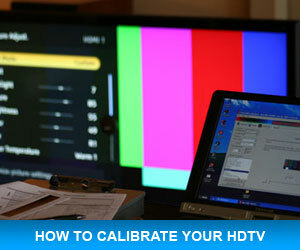 As a constant problem with LCD TVs, manufacturers have sought new ways to eliminate the issue. Any they have been very successful though not compared with plasma technology. While the "response time," of LCD TVs has markedly improved in the last couple of years, they still suffer from a slight "trailer" effect, where the individual pixels are just slightly out of step with the image on the screen. During fast moving scenes, the most discerning eyes can detect this slight motion response lag. Motion lag may also be detected on LCD TVs when the camera pans from side to side sometimes appearing to stutter or jerk. This we call judder. This applies to both flourescent backlit LCDs and LED backed LCDs. LED LCD TV manufaacturers have worked hard to overcome the motion lag/judder issue. Last years models saw the introduction of true 240Hz refresh rate (up from 120 which was up from 60). This year few models were introduced with a "manipulated" 240Hz refresh rate that is stated as 480Hz. The 120Hz change drastically improved the response time and the subsequent increases helped a little more. However, it also introduces unwanted video information by sharpening the picture background information and taking out necessary blur. This may seem like a positive, but with 90% of your viewing material, it is not. Depending upon the manufacturer, we advise turning off the 120Hz or 240Hz feature with all but live sports programming. See our full article about 120Hz/240Hz refresh rate here. There is a reason LCD flat panels are the preferred visual display units for use on airplanes: LCD TVs aren't affected by increases or decreases in air pressure. Their performance is consistent regardless of the altitude at which they're utilized. This is not the case for a plasma. The display element in plasma TVs is actually a glass substrate envelope with rare natural gases compressed therein. So, at high altitudes (6,500 feet and above), an air-pressure differential emerges, which causes plasma displays to emit a buzzing sound due to the lower air pressure. This noise can sound rather like the humming of an old neon sign. ADVANTAGE: LCD and LED LCD, at 6,500 feet and higher. LED LCD television manufacturers claim that their displays last, on average, 100,000 hours. LED lighting technology has indeed changed the picture life for LCD TVs. The reason is that LED lighting does not change color over time, while the older CFL flourescent syle backlighting does. When this happens in an LCD TV the white balance of the TV will be compromised. Current LCD TVs will probably last the same length of time as the LED LCD TVs, though your color quality will likely degrade. In theory an LCD TV will last as long as its backlight does. Since it involves nothing more than light passing through a prismatic substrate, there is little to wear out in an LCD TV except the backlighting. Pixels may become stuck over time. From our research, flourescent bulb backlighting in LCDs cannot be replaced cost effectively - contrary to opinion. LED backlit LCDs provide a longer lasting stability, with little to no degradation in white balance over time. One question we have with LED LCDs is how they will actually perform over time. We have not had enough time to know for sure. Plasma TVs, on the other hand, utilize slight electric currents to excite a combination of noble gases (i.e., argon, neon, xenon), which glow red, blue, and/or green. This is an essentially active phenomenon, so the phosphoric elements in plasma displays fade over time. Many manufacturers state a new half life of 60,000 hours. While I am skeptical of this spec, I do believe strides have been made to nearly even the playing field with LCD and LED LCD. At half life, the phosphors in a plasma screen will glow half as brightly as they did when the set was new. There is no way to replace these gases; the TV simply continues to grow dimmer with use. ADVANTAGE: LED, then Plasma, then LCD. Some manufacturers of both plasma and LED LCD state up to 100,000 hours use. At 4 hours use per day that's 68 years of employment. Where do they get these specs?? LCD technology is not prone to screen "burn-in" or "ghosting" (premature aging of pixel cells) due to the nature of the technologies "twisting crystals." With plasma, static images will begin to "burn-in," or permanently etch the color being displayed into the glass display element. The time it takes for this to occur depends greatly on the anti burn-in technology of the manufacturer. 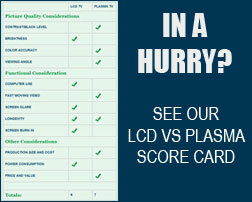 Recent improvements by plasma manufacturers have certainly extended the time it takes to burn in a plasma pixel cell. In the past I was concerned to place a DVD on pause 15 minutes. Now, many of the enhancements such as improved green phosphor material, oscillating pixels, and motion adaptive anti burn-in technology are greatly reducing the risk of burn in. It's gotten so much better that I don't even worry about it anymore. In a new model plasma from any top tier manufacturer I would put "ghosting" estimates at hours of use (Ghosting can be "washed" out by displaying static gray material or full screen images). Permanent burn-in I would put at more than 10 hours. ADVANTAGE: LCD, though not much of a concern unless you really try to burn in an image. All television measurements are stated in inches and are for diagonal measurement of the screen from corner to corner - not including framing. Both plasma and LCD TVs are becoming more readily available in larger sizes though plasma still leads the size battle by a great margin. 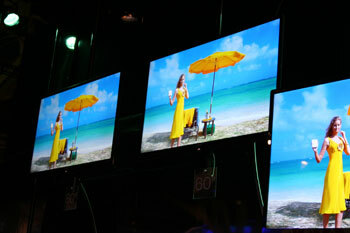 Pioneer and LG produce 61" plasma sizes while Panasonic has a readily available 65" model. 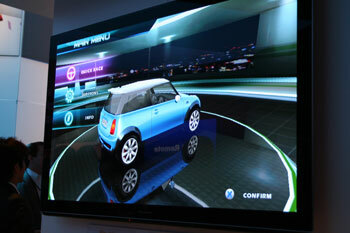 Though it is not being imported into the U.S. yet, Samsung has produced a gigantic plasma of 100 inches. Though such mammoth monitors are expensive, they exhibit none of the "kinks" one might expect with such large displays. In other words, even the largest plasma displays are reliable. Large plasma displays will consume power - try 675 watts for a 65 "display compared to around 330 watts for a 42" plasma. ADVANTAGE: Plasma, though the playing field is leveling. Even though production costs and retail prices have come down for both technologies, plasma still has the edge as far as production cost and capacity go..